Just a little refresher of expectations for once we return from the holidays. Writing should reflect serious attention to detail and demonstrate an understanding of the requirements for the class. While there will certainly be days when you fall behind in the reading, the general expectation is that you will read and be prepared for class discussion every day. If you’re not, I will have to assign other work for you to demonstrate mastery of the concepts. Respect for yourself, your classmates, your teacher, and your commitment to learning are baseline expectations. The date for the 2015 Summer Alumni, Friends, and Family Hike will be Friday, August 7, 2015. We’ll be meeting in Apgar at the Visitor Center at 10:00 a.m that date before boarding the shuttle to Logan Pass to begin the hike. The Highline Trail hike is just short of 12 miles and is strenuous more for its length than for its elevation climb. Because of the length and lack of access to resources on the trip, you’ll want to bring plenty of water, food, and sunscreen. The details about the trail are available at this link. This week’s roundup includes Picasso’s most famous painting, a call for an Internet rating system, a look at American beliefs about evolution, and more. Enjoy! Guernica is a mural-sized canvas on oil painting by Spanish artist Pablo Picasso completed by June 1937.The painting, which uses a palette of gray, black, and white, is known as one of the most moving and powerful anti-war paintings in history. Standing at 11 feet tall and 25.6 feet wide, the large mural shows the suffering of people, animals, and buildings wrenched by violence and chaos. The painting is believed to be a response to the bombing of Guernica, a Basque Country village in northern Spain, by German and Italian warplanes at the request of the Spanish Nationalist. Upon completion, Guernica was displayed around the world in a brief tour, becoming famous and widely acclaimed, and believed to have helped bring worldwide attention to the Spanish Civil War. In this week’s tour of the world, we’ve got a poem by cummings, a painting by Gaguin, and news about war and the $20 bill. And some other delightful things. 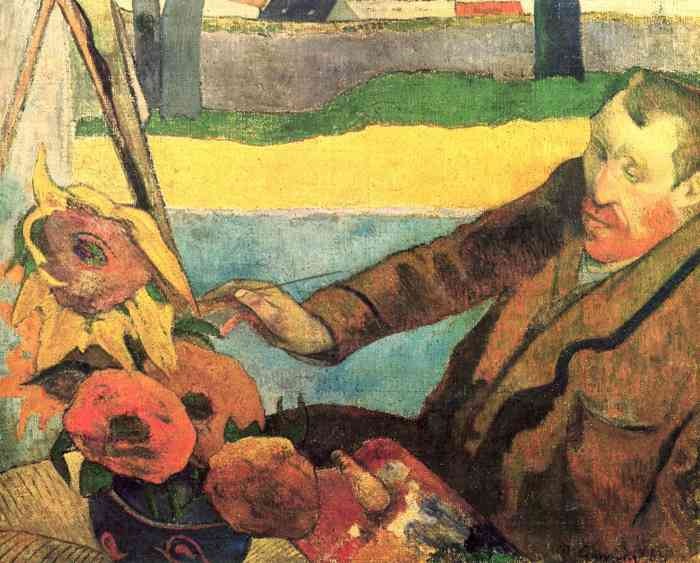 “The Painter of Sunflowers” is a portrait of Vincent van Gogh by Paul Gauguin in December 1888. The portrait was painted when Gauguin visited in Arles. Van Gogh had asked him to come to Arles, because he wanted to start an art-colony there. Gauguin however only stayed for two months, because the painters argued.